Ever since AC Milan signed striker Gonzalo Higuain from Juventus, this Sunday’s Derby della Madonnina versus Inter Milan was always going to be about the battle between two number nines. 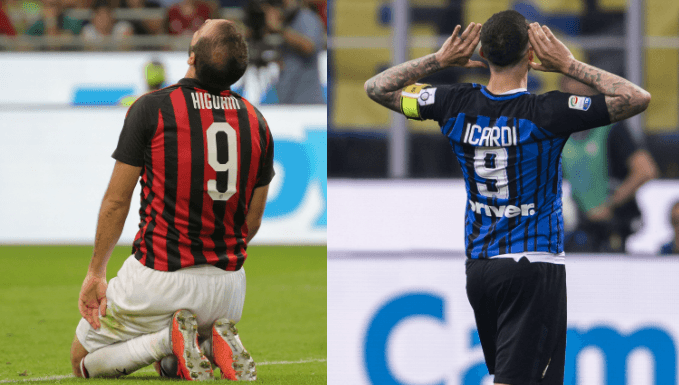 Higuain in the red and black stripes versus compatriot Mauro Icardi in black and blue - Such deadly strike forces going up against each other in this pivotal Serie A fixture is something that has not been seen since the 2011/12 campaign. Then, Zlatan Ibrahimovic and Diego Milito went toe-to-toe for Milan and Inter respectively. In that season, the eccentric Swedish star finished as league top scorer for the Rossoneri, with a total of 28 goals, his Inter counterpart finishing close behind with 24. While Higuain already has six goals from seven starting appearances in all competitions, Icardi will be keen to catch up as he sits one goal behind with five from seven. A clash between two giants of Italian football from the same city needs no further build-up, but the appearance of these goal-scoring heavyweights will provide added delight to the millions of viewers who will tune in worldwide on Sunday. The Rossoneri have suffered some turbulent times in recent years following the sale of the club from Silvio Berlusconi to Chinese businessman Yonghong Li, but the club finally seem to be in a stable position going into this derby under American owners Elliott. These two Milanese giants are just starting to come into form, with Inter having won their last four and the Rossoneri undefeated in their last six matches. No less than three of the last six derby encounters between the pair have ended in a draw, an outcome certainly worth backing on this occasion. Matchbook Sports offer 12/5 on a stalemate, an excellent betting option here. Even if history points to a stalemate, the goalscoring form of the two sides is not likely to bring about a scoreless draw on this occasion. Milan have found the back of the net in every match in all competitions this term, while their cross-city rivals have scored at least twice in their last three matches. 888Sport offer 4/7 on both teams to score, and Karamba have 3/1 on a draw with goals, both bets well worth making ahead of this fascinating clash. With both Icardi and Higuain in genuine form, it would seem remiss not to bet on both of these deadly finishers to find the back of the net in this clash. They will undoubtedly be desperate to write the headlines in this highest-profile of fixtures, and it seems probable that they will both score during the 90 minutes. 888 Sport list Higuain at 5/1 to score first or last, or 7/4 anytime, while a wincast on an anytime goal and a match outcome of a draw would yield an excellent 17/2 return. Meanwhile, a look at his Argentine counterpart reveals he scored both the first and last goals versus SPAL before the international break, his strikes often coming at influential moments in the match. While a bet on an Icardi first or last goal with 888Sport returns odds of 4/1, and it's 27/20 to score anytime, a look at the wincast on the site provides another interesting option. Should Icardi fire in the last goal of the game to secure a draw, the same site will pay out 20/1. A look at statistics reveals that the Nerazzurri have scored a staggering number of late goals this season, recording the highest number of strikes in the final 15 minutes (0.8 on average per game) in Serie A alone. They also scored twice after the 85 minute mark versus Tottenham in the Champions League, proving that this trend continues right through to the biggest of matches. BetHard offer Inter as last to score at 20/23, while a goal after 74:59 in the match results in odds of 5/6 from Bet365.